For those of you who are new, my name is Elna Cain, and I’m a blog & biz strategist and a mama to twins (they just turned 4-years-old!). I started Twins Mommy back last year as a way to engage with a new audience of mommies. It wasn’t until April that I really wanted to grow this blog. I wanted to start a new blog and grow my traffic, list, and income and share my story because I know a lot of you are struggling to grow your blog too! Blogging just for the sake of blogging isn’t going to earn you income. Turning your blog into a biz and then monetizing your blog, well that’s where all the money is. And I’m chronicling that journey with you! Before I get into my traffic and income report, I just wanted to give you a little snapshot of what happened last year. I started with 0 pageviews, and within three months, I tripled my traffic, subscribers, and followers! My email list took off during that time, and after 7 months of trying to grow my list, I had over 2,000 engaged subscribers! I have a free resource on 12 rockin’ ways to promote your affiliate products. These have helped me to triple my affiliate income, so make sure to sign up below to grab your free guide! As you can see although I did go up in pageviews by over 1k pageviews, it did not help me reach my goal to get 100,000 pageviews by the end of this year. The calculation for that is every month I need to hit AT LEAST 9,650 pageviews every month. I sort of knew this would happen since I only published 3 blog posts for February. From December to January I grew by 10k pageviews and a big part of that is content. I had more blog posts during that time than now. While I would like to create more content, I know that I don’t just want to put out fluff content; I want to provide the best tips and strategies to help mompreneurs in the making. One other thing I focused on in February was income. Out of those three blog posts, two of them were affiliate type posts. Usually there isn’t a lot of engagement on affiliate type posts and it totally showed with the lack of new pageviews for my blog. As far as what will I do to gain more traffic, I’ll keep doing what I’ve been doing but I know making more posts will ultimately help me grow my traffic. I will also add more descriptions to my pins that are optimized for SEO. This means adding keywords to my description and ensuring the pin image title shows what the pin is about. Goal: Guest post/podcast on 2 blogs – SUCCESS! February was the month of podcasts! I’m starting to really enjoy speaking on podcasts. While I’m not a refined speaker and I am an introvert, I love sharing tips and my story into entrepreneurship. My Big (hairy audacious) goal is to generate at least $1k/month from promoting products by April 2017. – ACCOMPLISHED! My mini goal for reaching my BHAG is to convert at least 1% of visitors that come to an affiliate post. So did I accomplish this goal? Wow! I can’t believe my blog made more this month than last month – practically 10x more! Before I go into my ideas of how this happened, I want to preface this by saying you can do this mama! I know you may feel defeated and frustrated that what you are doing isn’t working. 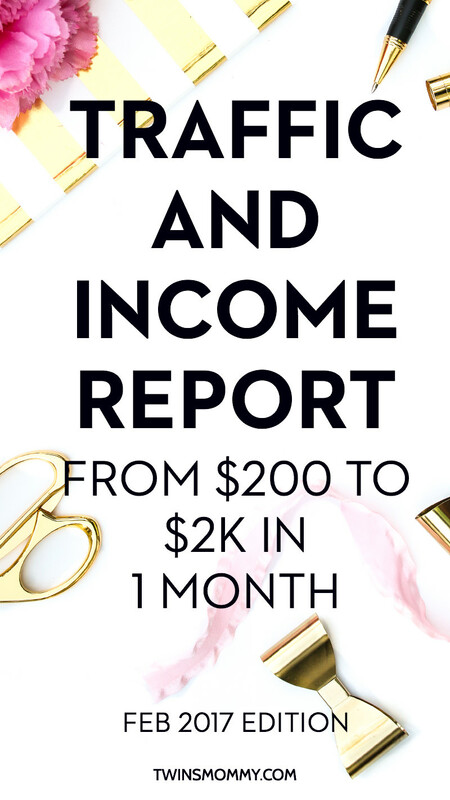 I want to share my income reports and strategies to help you become a successful mama! February really was spent working on affiliate posts. I made two posts – one for ConvertKit and one for Tailwind – and made sure to make pin-worthy graphics for them. I also made sure to put a link to my start a mom blog post on old posts that made sense. For example, I realized that this post was getting a lot of visitors and repins. I decided to add my affiliate link as well as create a mini tutorial on that post. I also added a link to my welcome email series for new subscribers. One of the things I wanted to do when I started monetizing this blog this year was to have more affiliate products to promote. I wanted to get onto Thrive’s affiliate program but they closed it in January. Well they opened up again, but it’s pretty exclusive. You have to apply and ensure that you can sell 10 times a month and have enough traffic. I didn’t get accepted. They felt my audience wouldn’t yield those numbers. I’m a bit upset by that since I’ve used Thrive for my other blog, love it and it’s a better option for mom bloggers who want to do really nice landing pages and opt-in forms. For now, I’m happy with the affiliates I have now, but know that I don’t want to rely on all my income with one income stream. Goals for March include creating a free email course to prime my audience, get going on making my course (got Teachable for my other blog’s course but will use this platform for my upcoming TwinsMommy course) and promote on my FB group (but strategically). My Big (hairy audacious) goal is to grow my email list to 10k by September 2017 – ON TRACK! February was a short month, which means lower email subscribers in the month. I needed around 850 subscribers for February but I’m still calling this on track since last month I made over 1k subscribers (so I can shuffle some for February). I did not do many list-building tasks this month. Since my focus was on affiliate marketing, I decided to let growing my email list go on autopilot. I’m in the process of creating another epic freebie (hoping to be the same impact as my 190+ free resource freebie) but this will take some time to get the content. Until then, I have to create more pins that show my freebies (which I’ve been neglecting), share my freebies on FB list-building threads and create dedicated pins for my freebies. Ouch, that looks bad. Yeah, I just wasn’t focused on list building this month. But, I’m hoping March will generate more subscribers. Overall, I’m still growing in all places – my traffic grew by 1k pageviews, my email list grew by 850 subscribers and income grew 10x from last month! I will continue to try to generate at least 10k pageviews, 30 subscribers a day and $1k a month. Over to you mamas – did you smash your goals for February? I got to your blog from the Buzz Feed post about bloggers. Maybe that article will give you even more traffic. Keep up the great work! Those are great numbers for a 2 month old blog! Congrats 🙂 Thanks for stopping by! Ahh your so good at this blogging thing! I have been at it for 4 years and still not monetised – you need to teach me your ways.. I would love if you could take a look at my site any advice would be amaaazzzing! Thanks! I’m still learning this all 🙂 Making money with your blog is a challenge for sure! I love reading your blogging income reports and your blog in general I always find useful information here. So much so I literally take notes on your post about blogging so I can improve myself and my blog. Great post. Elna, I’m blown away by your success. I find blogging very difficult. I’ve only been blogging for 6 months and although I’m ptetty happy with my page views and number of followers, I feel I’m not growing as afast as I’d like to. I did start my email list but am going to read about your tips on how to get more. I’m struggling with not having a vision of future income stream from by food, diy, and travel blog. I just don’t know what products to sell to people. I hope to get inspiration from you. You really seem to know HOW to do things and why. Thanks so much for your comment! It’s still a struggle for me 🙂 It takes a goal and vision for sure. For the longest time I was struggling with the same problem you are having with finding a product for your audience. What I did was look at my audience and thought of a simple thing rather than this complicated course or eBook. I hope that helps? Thank you so much for sharing your journey, it is so inspiring! And you’re doing an amazing job, juggling all those projects. Do you ever sleep?? I read some posts about Pinterest on your blog. Am I right and do you focus mostly on email and Pinterest? Do you recommend others using these too? I just don’t really understand Pinterest… Love to hear your opinion about this! Yes I primarily use Pinterest to drive traffic and Facebook for the engagement and sharing. I have an email list, but I’m just nurturing that list and notifying them of some blog posts I have! This gets me so energized!! I know what you mean. I still don’t know everything about affiliate marketing. I’m still learning 🙂 Thanks for commenting! Wow! Major congratulations to you and your amazing progress in just one month! I always love following along with your journey. Thank you so much for sharing it with us! By the way, I love how you refer to your goals as BHAD. It’s perfect. Sometimes I find that my goals aren’t, ‘BHAD’ enough. I need to learn to push myself a few steps further to keep me on my toes. Love this about you! I always see your pins on Pinterest! You have a great blog and course!! Thank so much for following my journey! PS – totally meant BHAG haha 😉 You know what I mean! I just LOVE your site! So beautiful and fun! Thank you so much. I was worried this income report was too unrelatable. I don’t want to give a false impression that it was easy to get to this point! I failed numerous times and even now, my income for April is lacking (but that’s something I will share with my audience). Thanks for stopping by! Congratulations on your accomplishments!! That’s so exciting to see (and inspiring!) I love that you are so honest about what didn’t go so well for your goals as well- because that’s the life of a busy mom, right?! I’m looking forward to summer when my teaching job can take the back seat to my blog and I can really focus on growing my list and getting my name out there! I look forward to your next post!! Thanks! Yes, there are a lot of things I try to do, but not all my goals are accomplished! I do have epic fails a lot of the time! I know my March report will take a hit…but I’m still doing what I have to do! Hi Elna, First of all, I want to congratulate you on your success. I’ve been following your blog for a while and always find really good stuff. Wish you all the best for your future. Thanks! Congrats!! You are rocking it, I am so looking forward to your future income reports:-). You are my spirit animal! Thank you for sharing all that you do. As I am trying to monetize with affiliates and get my portfolio together for freelance writing, you truly are inspiring. It’s rewarding to know that this is possible. That’s great mama! Love that you are freelance writing 🙂 My sweet spot for a service on your blog!!! I love your amazingly informative, yet to the point posts! I find your blog so valuable. Thanks for writing this post! Thank you so much! I’m so humbled hearing this 🙂 I love writing on Twins Mommy but have a hard time finding time!! But, I’m hoping to turn that around this month at least! Thanks for stopping by! Great post Elna! I appreciate you breaking down each section so we can get a good grasp on what you did and didn’t do. Thanks for the encouragement! I know I can make an income happen for myself. I just need to do those things that I have planned. Congrats! You’re an inspiration and I always love your content! Congrats, you’re such a rockstar! I love that you had such a solid foundation in place that you were able to monetize so quickly. I think one of the great things you do is write really long, juicy posts, so you’re always sharing valuable info and not pushing products. That’s why I keep reading! Thank you so much. I was hesitant to publish this post because I don’t want people to be upset about their own journey. It almost took me a year to make that on this blog…right? I made some mistakes and didn’t optimize my blog for income growth until just recently…you will definitely get there!! Can’t wait to hear about it! Congrats, good post, great info. I signed up for the help on promoting affiliate links, I cannot wait to get it. I have been an affiliate for about 5 months but have struggled with it and how to promote it in my blog posts, so I hope to learn a lot from you on how I can begin using these affiliate companies before I lose them for not getting any traffic or sales. Thanks again. Thank you so much! I hope you enjoy the guide. In my welcome series you’ll get a link to the Mom Boss vault and there are more guides to help you grow your income!! Thanks again! So exciting! I have no doubt that your blog will continue to skyrocket! Aww thanks! Who knows right? My income for March isn’t as high as Feb’s income, but I’m still happy. I still have to divide my time between sites and I focus more on the site that generates more income for me! Ha…Twins Mommy is motoring around!! Wow, what amazing progress! It still amazes me that you’re able to run 3 websites, is it? I’ve had a hard time finding time to create content on my own blog this month, and my page views are down because of it. Because I have been focusing all my attention on my freelance writing and VA services. I don’t know how you do it all! I’m dreading how I’m going to handle everything once school is out for the Summer too lol. My daughter is 4, and she’s been in a Montessori preschool since she was 2.5 (and she will still there until she’s ready to go into Grade 1). So I’m thinking if I’m having a hard time finding time for everything now.. just wait until I no longer have those 5 hours everyday. Love reading your new posts! You’re doing amazing! I LOVE LOVE LOVE your blog. It’s so beautiful and your graphics are awesome 🙂 I don’t run three sites. Only two: Twins Mommy and Elna Cain. I do have FreelancerFAQs but I don’t really write content on that and I just handle submissions! But yes, it’s very very hard for me to divide my time. I’m focussed on Elna Cain and my email list, sales funnel and my course students… But, I have some time NOW to focus on Twins Mommy! It’s hard for sure. My twins aren’t in school so when they are in school I fear I’ll get outside pressure to work out of the home…no one really knows that I freelance write and am a blogger! Oh well…only time will tell… You’re doing an amazing job and I see your Pins everywhere! So Freelance FAQ’s is mainly made up of content from other writers then? Congrats Elna on your accomplishments. I also love that you acknowledged where you will be improving next month as well. You definitely inspire others of what is possible when focusing on providing value with your content!